It seems there are always new visions to enchant us. In the course of preparing this Advent Calender I have usually picked paintings which are classic representations of their theme. I came across painters whom I had never heard of and paintings which I had never seen. Such a case is Luca Cambiaso and his Madonna. Luca is a little-known fresco artist from Genoa whose work seems to be very rare, both online and in museums. This lovely Virgin and Child is striking for so many reasons: it seems so fresh, so modern compared to most of the other Madonnas we known. 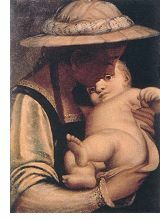 It perfectly captures the love, tenderness and bittersweet quality of Mary's feelings for her baby.